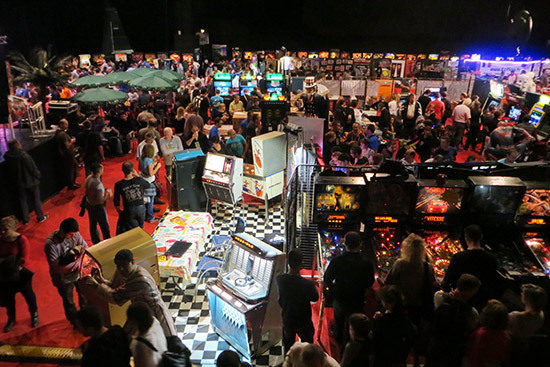 Last year I read the report on the 2013 edition of FestiFlip on Pinball News. 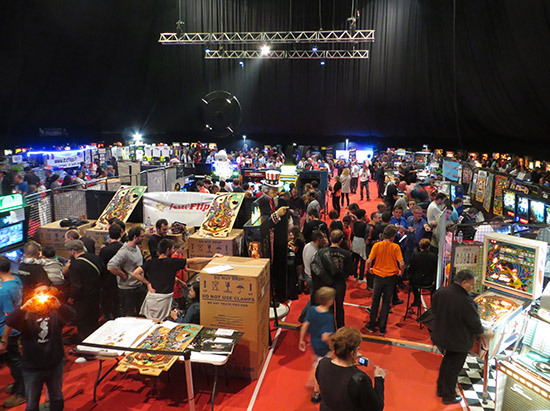 According to the article it’s a huge French pinball show held in Saint Étienne. 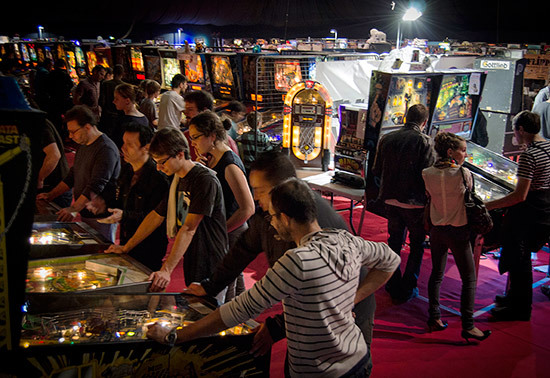 I have been to French pinball shows before, but this one was of a different size and order. Over 200 games and over 2,500 visitors? I decided on the spot that I had to be there for next year’s edition. In the meantime, I - as editor of Pinball Magazine - published the book PINBALL by Argentinean photographer Santiago Ciuffo. It turned out that Santiago and his girlfriend were planning to come over to Europe to attend the show as well. Even more reason to visit the event. So here is my report. Since Santiago brought his camera, most of the photos in this report are by him. Saint Étienne in France is about a 10-hour drive from where I live in Holland. I was able to get a ride, but it meant leaving on Thursday night and driving all night to avoid most of the traffic. It worked well. I arrived, feeling pretty tired, at the venue around 8am where I was greeted by Phil Keller, one of the organisers of the show and my main contact since his English is pretty good. Boy, that’s a large venue. Think of it as a sporting arena with a huge floor. There’s an upper ring with seats surrounding the main floor, but black drapes were hung from the ceiling so these would not be visible from the main floor. It also helped to create a more intimate setting, as far as that is possible in such a large hall. You enter the building on the ground floor, but the show floor is actually a bit lower and is reached by walking down some stairs. On the ground level there is a hallway surrounding the main floor. This area had plenty of windows to let daylight in, while that was not the case on the main floor. Right next to the main entrance, a Rocky & Bullwinkle pinball machine was set up. This turned out to be the main prize in a raffle that was held during the weekend. On the show floor the first games had already been set up, but the room was still pretty empty. Besides those few games and the first vendor stalls, there were quite a few statues of popular movie characters to be found all over the main floor. These were supplied by Happy Days from the nearby city of Lyon. After meeting the organising team, I was shown where the Pinball Magazine booth would go and set my stuff up. Then I tried to catch up on some sleep in a dressing room in the back, followed by checking-in to my hotel and taking another nap. By 6:30pm I was back at the show hall and the place was filling up nicely with mostly electronic games from the ‘80s through to today. Just like I had seen in the photos from last year, most of the games were placed in two rows on the outsides of the hall, forming a big circle of games, with more games on the left and right when you’re walking through. 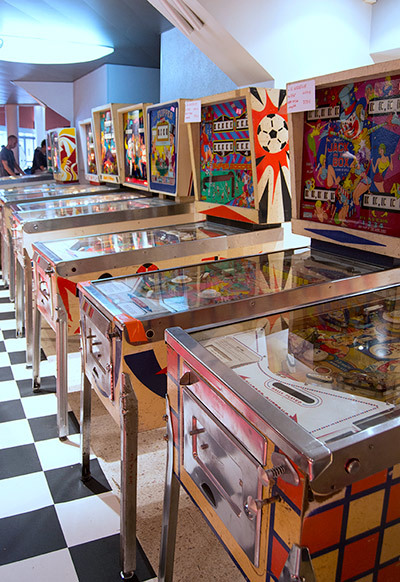 The inner space of the floor was used for vendors, some Foosball, billiard and air hockey tables, and a row of eight Black Hole pinball machines. The first year of FestiFlip they had a similar row of Medieval Madness games and last year they did the same with Data East’s Guns ’n Roses. Hung above the row of Black Hole games was a giant motorized replica of the rotating backbox mechanism. While more and more games were being set up, I played a couple of games on machines I had hoped to see, or hadn’t played for a long time. Amazon Hunt (the first version by Gottlieb) was one of them. There were two examples of this rare game that had different settings. Hot Shots and Maverick were also games I was looked forward to playing. The Hot Shots still had a high score of mine on it, which I put on that game a few years ago at the French Flip Expo spring show. I also played a few games on The Wizard of Oz, which I hadn’t played in a while. In the meantime the software has improved a lot on the game, which definitely made it a more complete game to play. Speaking of The Wizard of Oz, Christophe Lienard had a small booth with nine WOZ games in it. During the show only four were set up on Saturday, and five on Sunday. Had he had a bigger booth he could have made a similar display as the Black Hole row of games. There was a dinner scheduled for 8:30pm for all vendors and some VIPs. As that required setting up large rows of tables and benches it started a lot later than scheduled. Jersey Jack Pinball’s Jack Guarnieri, a special guest at the show, joined me at my table. I had no clue what was being served, but it was fun. Jack told some great stories and is excellent company to be around. While the dinner was still going on around midnight, we headed back to the hotel to get some (much needed) sleep. The next morning I met Jack and Christophe for breakfast, after which we headed to the show around 9am. Inside, last preparations were taking place, while outside at the front a queue was starting to form. At 10am the first people were able to buy their tickets for €4 (about US$ 5.00). Apparently in the first half hour over 700(!) visitors entered the building. There was a show program complete with tournaments, which I completely missed as I was manning the Pinball Magazine stand. In the afternoon I could walk around a bit as Santiago Ciuffo, the Argentinean photographer of the book PINBALL, and his girlfriend had arrived. This was actually the first time we had met face-to-face. It was great to see them both, and we quickly caught up. While their English is not that good, we manage to understand each other by combining English and Italian, which seems to work well for us. Santiago was amazed by the size of the show and the number of games present. 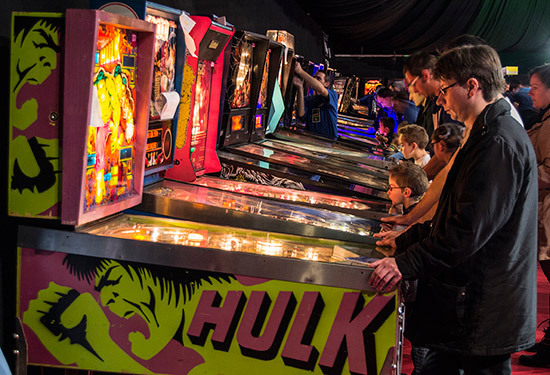 Someone told me there were 317 games in the building of which more than 300 were pinballs, which may even be a record for a European pinball show. When I got a chance to walk around I noticed a lot more games had been added to the hallway outside of the show floor. On the left of the entrance there were mostly solid state and DMD games, as well as several video and darts games. 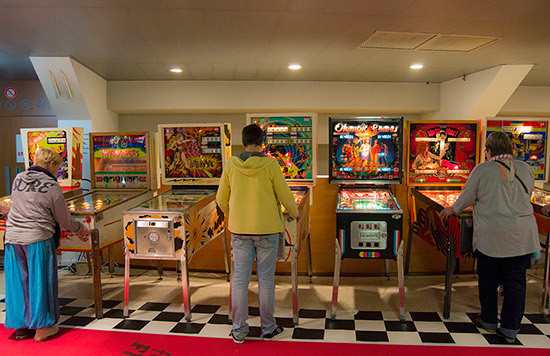 On the right from the main entrance a selection of about twenty electromechanical games had been set up. These included a Humpty Dumpty woodrail from 1947 - the first pinball machine with electromechanical flippers. Not all of the EM games were working and some even had all playfield plastics and rubbers missing. There were at least three Gottlieb Canada Dry machines, a special game created for the French market to promote a soda drink. The layout is the same as on Target Alpha and El Dorado, but the artwork is different and probably one of the first licenses (or product placements) to be used on a pinball machine. One of the Canada Dry games was placed inside in a clear cabinet. At the end of the right hallway there was a separate room filled with PinSound-equipped DMD games. PinSound is the name of a company run by the brothers Nicolas and Timothie Manaud, who produce the PinSound sound board. This sound board can be added to many of the Bally or Williams games from the ‘90s and enhances the audio experience. For an accurate list of games in which the board can be installed, see the PinSound website. Besides allowing you to plug in headphones, the board also replaces (depending on the game) the original soundtrack with a remixed or improved one. On games like The Addams Family or Terminator 2 the original game’s music has been replaced by the original orchestral movie soundtrack. All the sound effects in the game have also been turned into stereo, which is extra noticeable when listening to it with headphones. I played some of the set up games after the show closed and was pretty amazed by the improved sound quality. If these guys could have access to the original, uncompressed sound recordings and voice calls of the games, they will sound so much better. 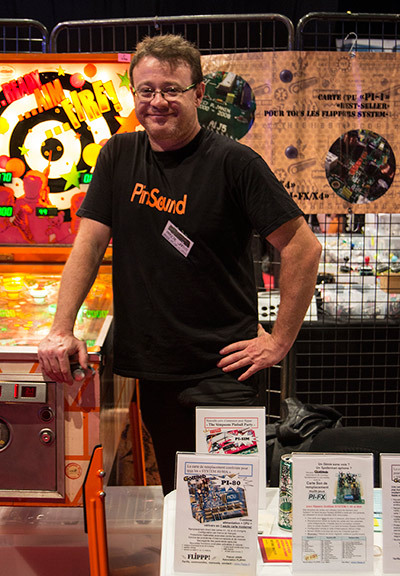 Speaking of pinball boards: Flippp.fr also had a stand at the show, opposite the Pinball Magazine stand, in which they offered several replacement PCBs for Gottlieb, Bally and Stern Electronics pinball machines. Besides replacing some of the original boards in the backbox, these boards also add extra functionality to the games, such as turning numeric games into alphanumeric, a ball saver, adjustable extra ball and tilt warning settings and much more. I spotted quite a few Gottlieb games on the show floor that were running on these boards too. In the same category there was also a small booth by Flipprojets in which they displayed some display testing fixtures. They also offer PCBs for Gottlieb games which enhance the gameplay experience by adding speech and other features. See their website for a detailed listing. I didn’t make a list of all vendors, but from the top of my head I remember Ecflipp (pinball parts), Zpeakabonks Pinball Paradise (pinball parts), Private Gameroom (magazine), a stand selling key chains with the image of a pinball machine on it, a few used parts vendors in the hallway, a jukebox vendor, two different virtual pinball machine vendors and of course the Pinball Magazine stand with Santiago Ciuffo autographing his book. Early in the afternoon there was a small flea market in front of the main entrance, which I sadly missed. There was also something going on in a party tent where someone was explaining about clearcoating a playfield, but as it was in French I didn’t stay around long. During the afternoon I noticed it was getting crowded, but due to the size of the venue the show floor never looked packed. The only area where queues formed all day long was the food stand. Here, cold drinks, coffee, tea, sandwiches, hot dogs and crepes were served for very reasonable prices. The hot dogs and crepes seemed to be very popular. Later I heard that more than 2,000 visitors had attended on the first day. I don’t recall ever attending any previous show with such attendance numbers. 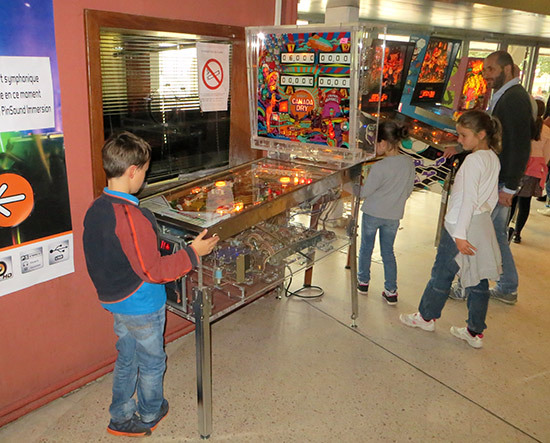 I think it shows how popular pinball still is in France. The show ended at 7pm for those with a regular ticket, but that didn’t mean it was over for the day. Just like on Friday all vendors and those who had brought games received VIP tickets for a dinner after the show. Once all the regular visitors had left, the building was locked (the front gate closed), which meant some people who had gone outside were then unable to re-enter. Prior to the dinner everybody gathered in the EM area in the hallway for a Happy Hour where free drinks and a selection of biscuits were served. Meanwhile in the main hall the tables and benches were set up for the dinner and a band was busy with their sound checks. The dinner consisted of a three course meal, and it went much more smoothly than the previous evening. Following the dinner, at around 10:30pm there was a small raffle for vendors, and several people were called to appear on stage to receive a bottle of FestiFlip champagne as a token of appreciation for their attendance. After that, Phil Keller, one of the main crew members and a professional magician, did a small magic show. 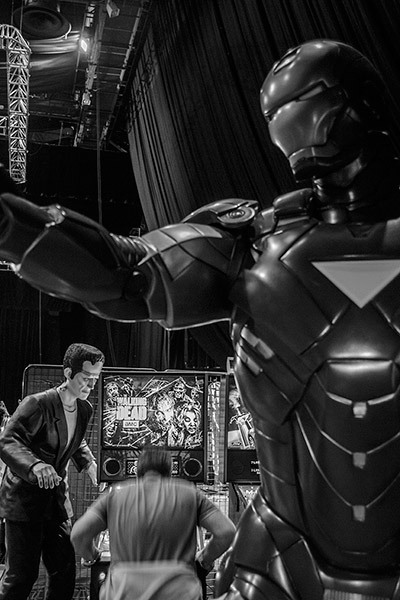 He revealed a FestiFlip pinball machine from a giant crate, which was displayed on stage on Sunday. His performance was followed by a pretty decent ZZ Top cover band. Soon after the band started playing, the first games in the hallway were turned on, later followed by the games on the show floor. I left for my hotel around 1am, but there were quite a few people still inside playing games. 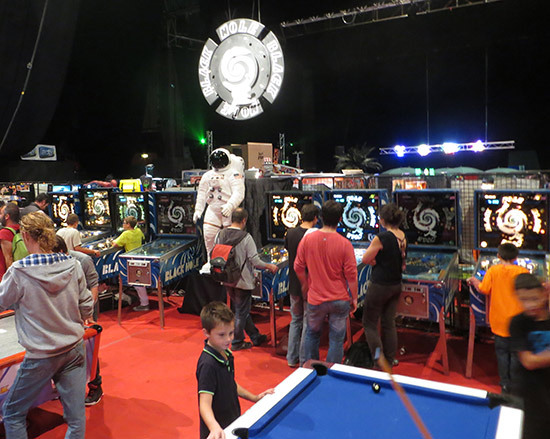 I have to note that having visited quite a few pinball shows around the world the French organizers seem to be very creative and inventive when it comes to rewarding those who make the events possible. 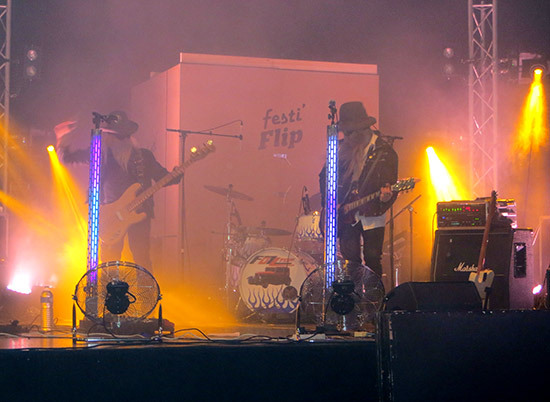 These VIP evenings are just one example, but it sure worked well for FestiFlip it seems. For other shows that seem to struggle with getting games or people to help out, the French shows may be an excellent example of how to stimulate people into participating. On Sunday morning at 10am, the doors were opened once again. You might expect the show to be more quiet on a Sunday, but that may only have been the case the first hour or so. Just like on Saturday, a lot of people visited. I was surprised to see new visitors frequently arriving after 3pm, while the show would close at 5:30pm. Then again, an admission of only €4 is still a very good price even for a couple of hours on the 317 games on free play. Rebecca Astley, Phil’s assistant, helped a bit out at the Pinball Magazine stand explaining to visitors what the book and magazines were about, and what the special offers were. Thanks for that Rebecca! Just like on Saturday, several smaller tournaments were run of which I have no idea how they went and who won. I understood the kids tournament was split into three different age levels. The games for this tournament were all on short legs, so all kids could play them easily with their feet on the ground. Note that all these tournaments were more like side events. Unlike other shows, the main focus on FestiFlip is recreational pinball, which I found quite interesting. Around 5pm, with the event still going on, the first games were being removed. Around 5:45pm all games were turned off and everybody who brought games started to pack them up. 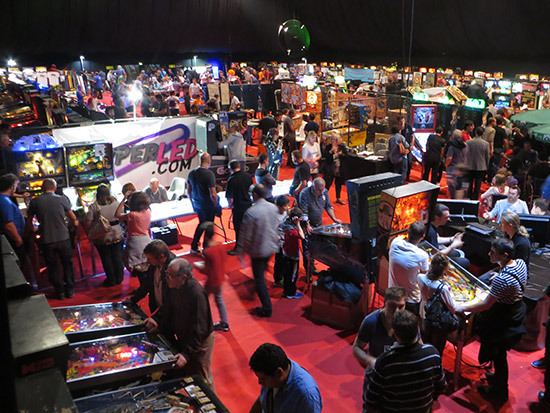 It seemed to me the second day was almost as busy as the Saturday, and in fact the overall total for the two days was 3,300 visitors, which implies FestiFlip is Europe’s biggest pinball show overall. I had a great time and will recommend this show to anybody who like to play pinball. I'm already looking forward to the 2015 edition.